While tiny Hayesville, with a population of just 300, might seem an unlikely place to discover authentic red beans and rice and other Creole fare, Dennis Barber, chef and owner of The Copper Door, couldn’t resist bringing his native flavors to town. Here, the former Louisianan, who got his start at a number of New Orleans restaurants, sends out dish after dish featuring spicy sauces, along with steaks, savory crepes, and tortellini with crawfish. An extensive wine list of more than 150 labels is geared toward wine enthusiasts. You won’t find any grocery store labels here, notes Barber. The town called to Barber, who moved to the mountains by way of Atlanta, and, with his wife, converted this former gas station into an upscale dining venue. The gleaming copper door beckons from Hayesville’s central square. Inside, tables by the windows and the convivial bar share a brightly lit space. In contrast, the main dining room sets an elegant, intimate scene with low lighting, cozy booths, and a grand stone fireplace. But this is the season to dine al fresco in the restaurant’s courtyard. “This location and I agree on styles and flavors, it seems,” Barber says. Those flavors include steaks—filet mignon, beef tenderloin, rib eye, and New York strip—which are the big draw for evening diners. 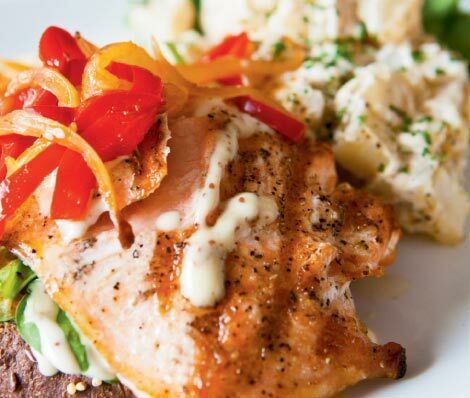 But a true showcase of the kitchen’s finesse is a salmon fillet grilled to perfection to give it a buttery crust. The tender meat is served on a thin slice of char-grilled pumpernickel, and accented with sautéed red peppers and onions. The creamy wild mushroom bisque, subtle with sweet undertones of Madeira, and a salad of Belgian endive, spring mix, candied nuts, mandarin oranges, and goat cheese are just as appealing. Crawfish, shrimp, and scallops in a spicy Creole-style tasso sauce fill the savory seafood crepe. The special of red beans and rice with andouille sausage further emphasizes the chef’s roots and love for simplicity.